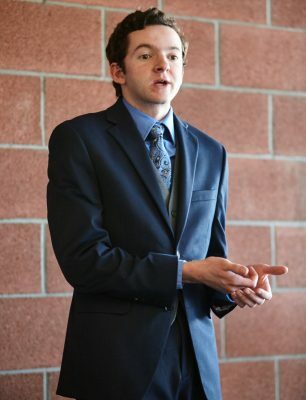 GCU’s Speech and Debate teams placed second overall in the Jannese Davidson Memorial Tournament at Concordia University in Irvine, Calif.
A proposed defense treaty between the United States and the Philippines – and its effect on China – proved to be a key improvisational speech topic over the weekend. 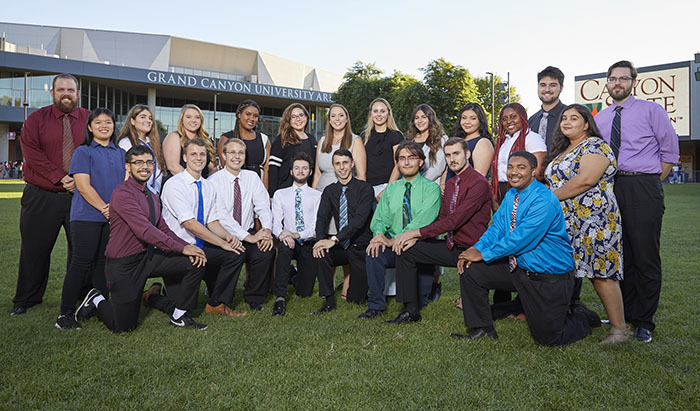 The strength of improvisation, particularly on that defense treaty topic, carried the Grand Canyon University Speech and Debate teams to a second-place overall finish on Sunday, behind Point Loma Nazarene, in the 24-team Jannese Davidson Memorial Tournament at Concordia University in Irvine, Calif.
All five of the Speech team members who made the road trip qualified for the finals, ranking in the top six in 11 of the 16 events. The efforts of the 10 Debate team members also contributed to the overall finish, according to Michael Dvorak, director of Forensics. In her very first meet, freshman Jess Kennedy won the novice extemporaneous speaking title and senior Tommee Gleason claimed a runner-up finish in varsity extemporaneous speaking. Jess Kennedy won the novice title. They were each given three topic choices in each of three rounds and allotted 30 minutes preparation time for a seven-minute speech in each round. In her first round, she spoke about whether the U.S. should assist Brazil in joint action against Nicolás Maduro, the embattled president of Venezuela who has viewed U.S. recognition of Venezuelan opposition leader Juan Guaido as an attempted coup. Her second topic was about how the growing rift between Italy and France has impacted European Union migration policy, and her third topic was about the proposed treaty between the U.S. and the Philippines. Both Kennedy and Gleason ran into that situation with the treaty topic in the finals. Ostensibly, Gleason argued that China would perceive the treaty as a direct threat from both the Philippines and the United States. In the first round, Gleason spoke about Egypt detaining anti-government protesters and his second round topic centered on reforming the U.S. health care system. Along with Kennedy, it was also the first meet for Sam Hesman, a newcomer to the team. The sophomore from Summit Christian Academy near Kansas City, Mo., finished fourth in extemporaneous speaking and took advantage of the collaborative efforts of the group. At each team practice, the extemporaneous group meets for one hour to discuss possible topics they might encounter and strategies for lighting fast preparation. “It was pretty exciting. I kind of had no idea what I was doing at the beginning, but I was quick to pick it up,’’ said the entrepreneurial studies major. There was no shortage of motivation among the team members, given that they were sidelined for their last meet. It was scheduled for Jan. 12-13 at Bradley University in Ill., but due to the government shutdown affecting Transportation Security Administration staffing, their flight was canceled. GCU’s finish was indicative of their quality despite entering a small squad. Several other universities fielded teams of as many as 30.